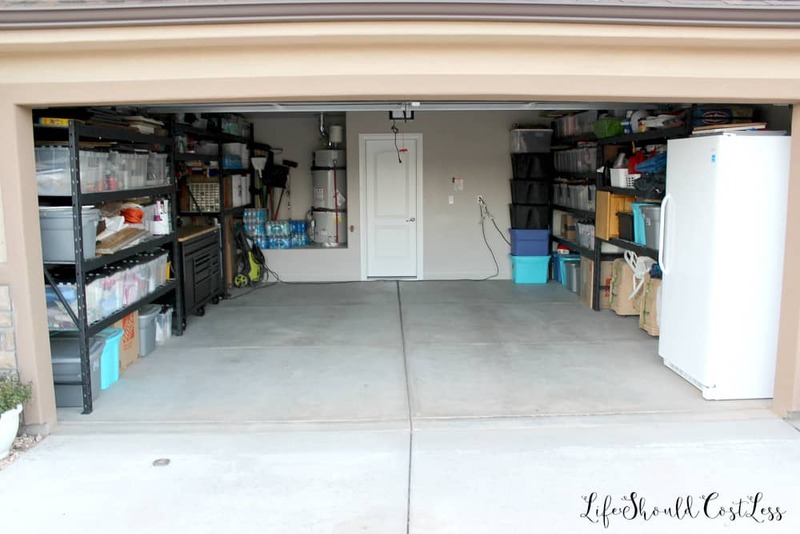 I FINALLY finished my garage organization project that I have been working on since February! Holy Moly it was time consuming and probably one of the biggest reasons that I have not gotten as much content up as I would have liked to this Spring and Summer. Anyway, the before pictures are super embarrassing to show all of you, but the after shots make it totally worth the shame. 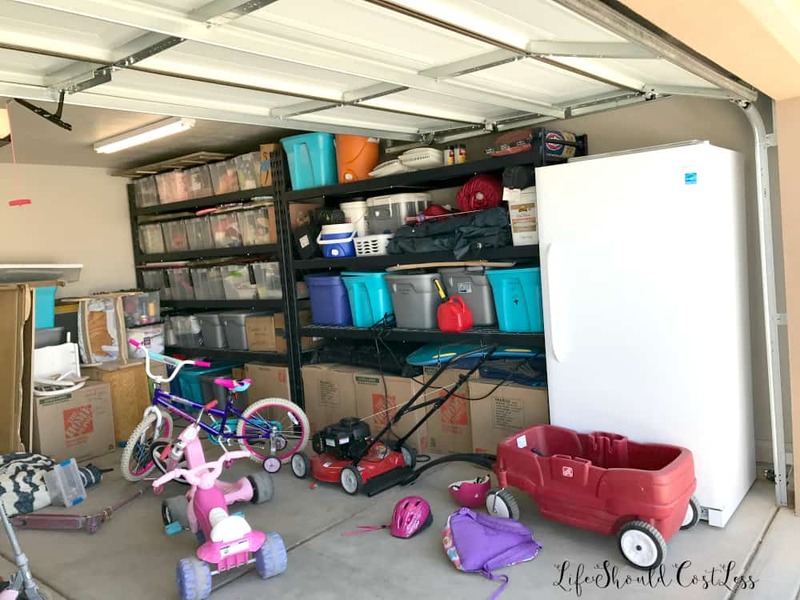 Keep in mind that this is the first place I have lived as a single mom and when I separated from my ex I lost 2000 square feet of house…so space is scarce and the storage in this place is a joke so the garage became the resting place for all of our “not used frequently” stuff. 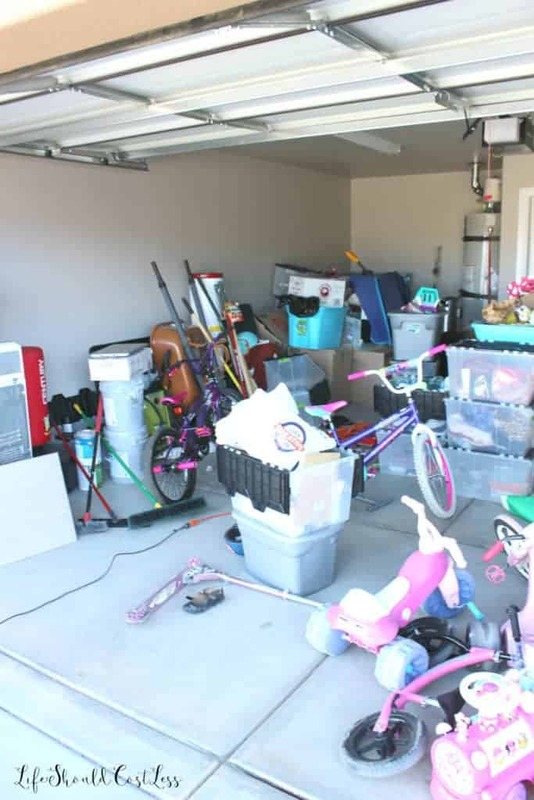 It may be a two car garage, but there was no hope of fitting even one car in there it was so bad…take a look. 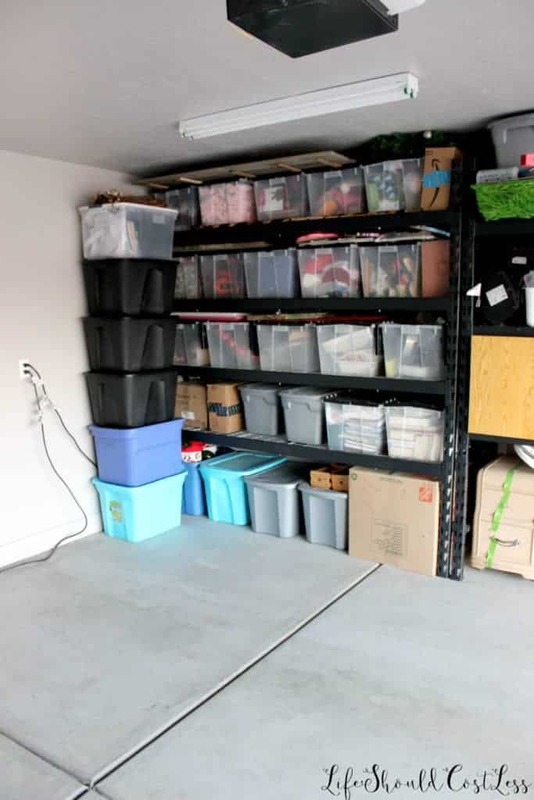 I know that I could have just gotten a storage unit and not looked at or worried about all this stuff, but having another monthly payment just didn’t make sense to me when I knew how quickly that could add up. 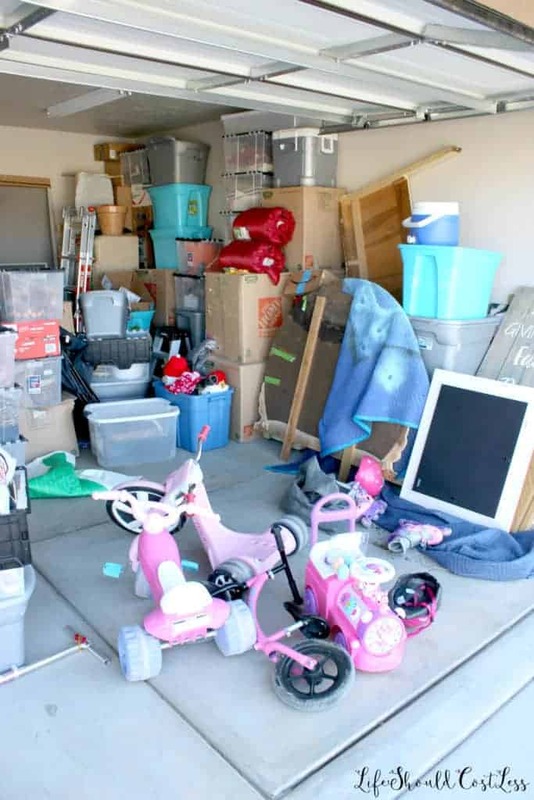 Plus, when you are a single parent and you have four kids, popping over to a storage unit to get to our stuff is just not practical, we need to have easy access to our stuff otherwise it is just too tempting to pick up a replacement when I’m already at the store…which would cost even more money. 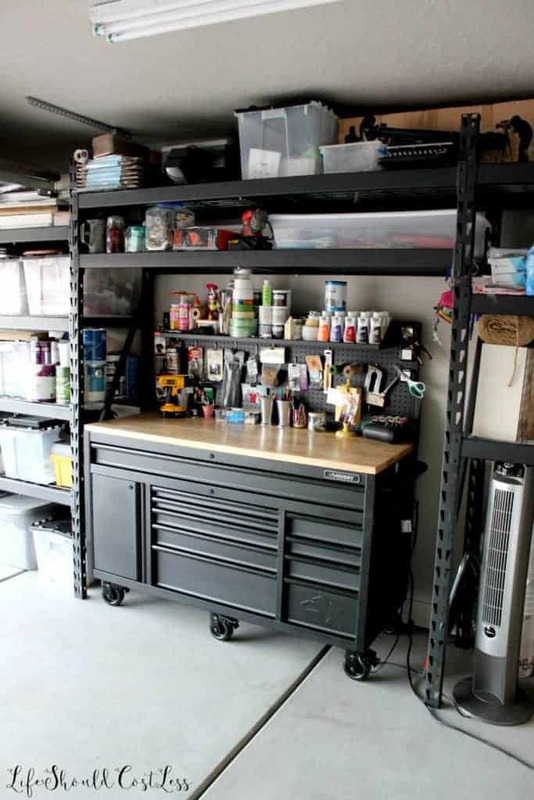 The reason that I chose to buy a bunch of shelving and a work bench was because I was planning on living here at least three years and if I were to have a storage unit for around $130/month the total cost of that would have been about $4680.00 for three years of storage… YIKES! I told you that a monthly payment like that can really add up. Talk about throwing money into a pit and having nothing to show for spending that kind of money when the three years is over. Figuring out exactly how I wanted to do my shelving was the hardest part. I knew that I couldn’t do it out of wood and cut and build it myself or it would have taken me the whole three years to get it done (in what little spare time I have). I also needed to find shelving that was free-standing so that I did not damage the walls in the rental. Yes, I can patch a hole like a pro, but I just didn’t want to have to deal with the hassle of extra work when I’m ready to move. So, I decided to go with some heavy duty Husky brand shelving that I got at The Home Depot. I’m a big fan of Husky products (not an ad, just my opinion) because they are well made and not too expensive. 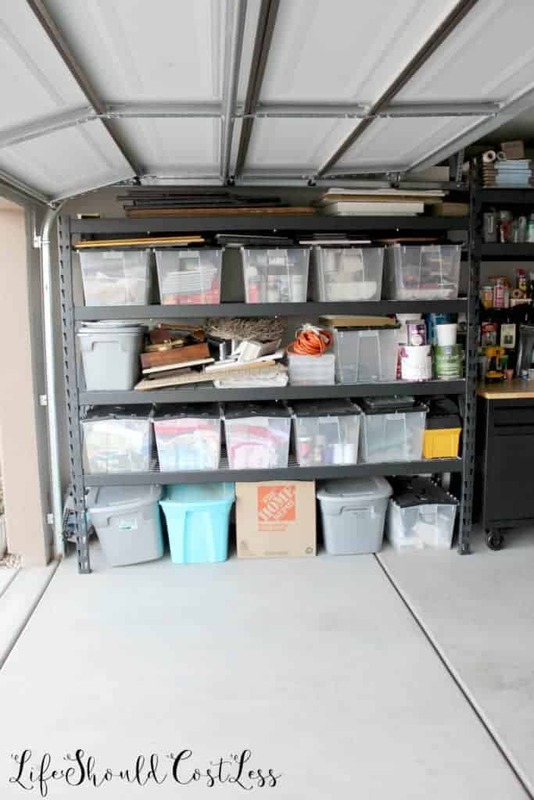 Anyway, I put mine together in a nontraditional way (probably not recommended by Husky), it just made sense to me to piece it together differently to maximize the storage (I am not suggesting you do it the way I did, just make sure it’s sturdy if you color outside the lines like I did for safety’s sake). Here is the project during as I was gradually putting it together. 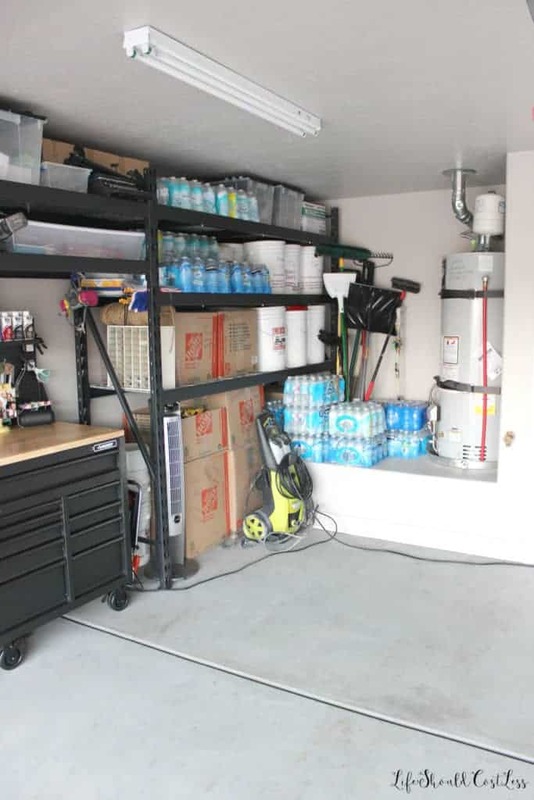 I had to keep pulling everything out of the garage into the driveway so that I had plenty of room to work. When I got some of it put together I started using some of the finished shelving so that I would not have to pull so much out each time. 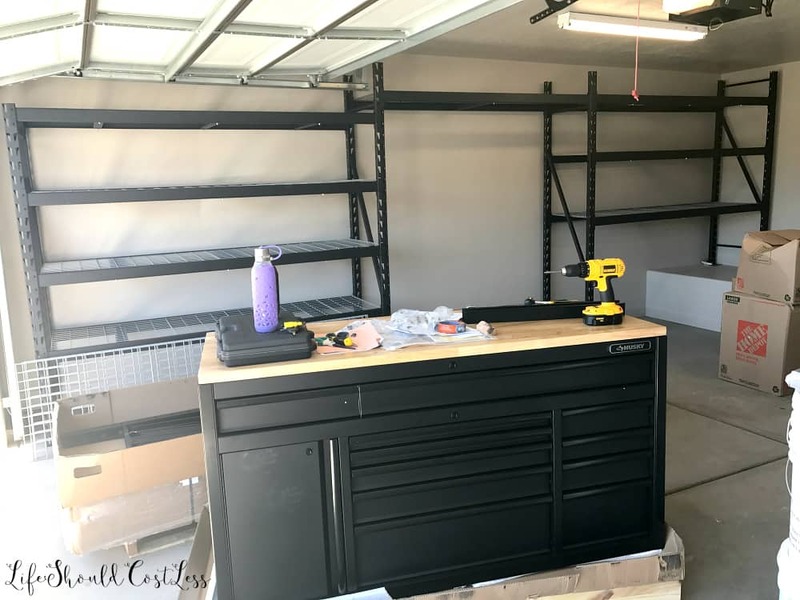 My one splurge on this project was buying a nice work bench (also Husky brand found at Home Depot), I needed to be able to have a space to work on projects and to be able to lock the drawers to keep kids out of stuff so I consider my work bench an investment in myself. 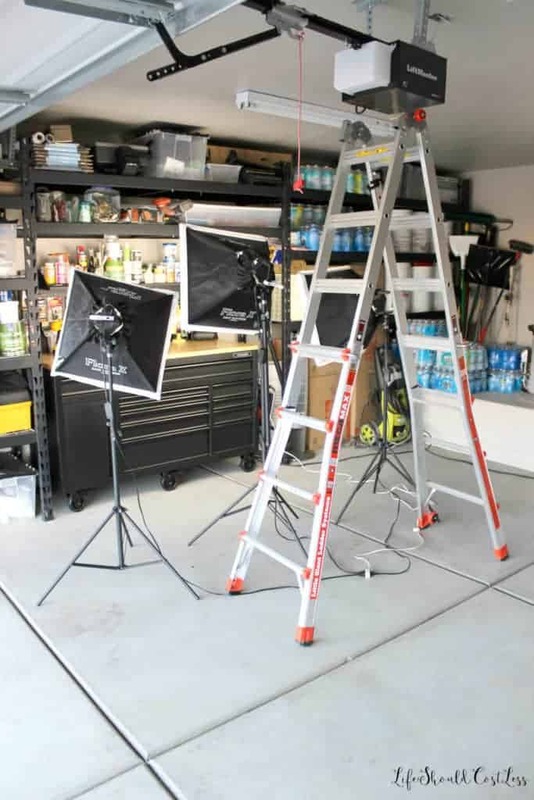 I now have a pretty place to shoot any DIY projects for this blog, the only one I have published on the site so far was my Bread Box Make-over, you can stop here and check that out too if you want. 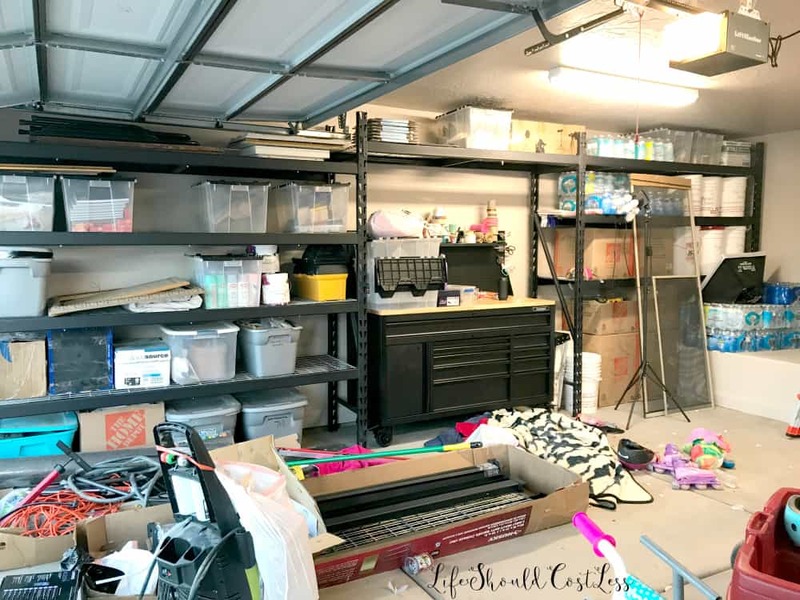 It frequently became a big fat mess, but as with any organization project…you have to make a mess in order to make any progress. 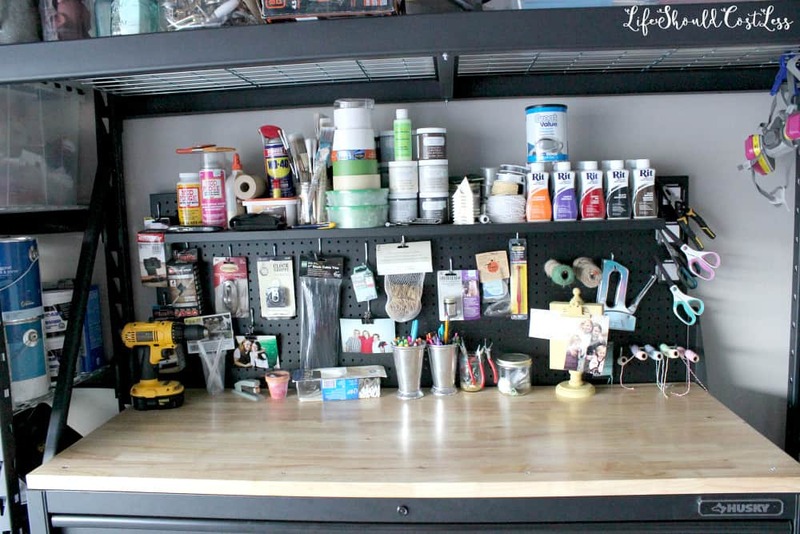 Putting things on the shelving during the project was helpful so that I knew how much more dejunking I had to do. Going through all of the boxes was a total pain but I ended up having enough junk to take three loads to the DI. I also hit the Memorial Day Sale on appliances that Home Depot had and was able to save a bunch on a freezer. 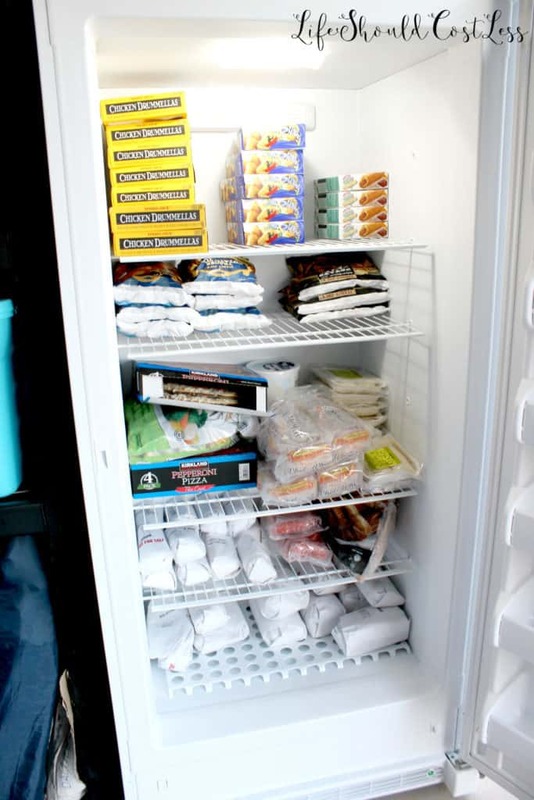 I made sure to plan enough room to have a freezer because the one in the kitchen is way too small for a family of five. Now look at that! I finally got it done, the only help that I had was putting the casters on the bottom of the work bench and lifting it back up. My dad and little brother were amazing and did that for me… that sucker is over 400 lbs so there is no way that I could have done it myself so I am super grateful that they were willing to help. Now I get to show you the final results in all their glory! I finally have my dream garage. Here are some close-ups of the work bench. It’s not totally organized the way I want it to be, but I definitely can find everything and it has been wonderful! 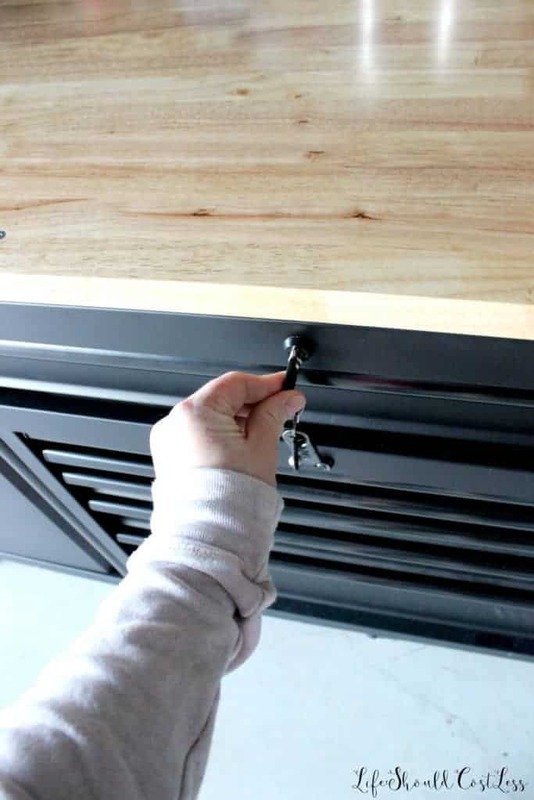 has deep soft-close drawers so that things don’t slide around. Everything stays just where I want it. I thought my little brother was going to have kittens when I told him what I was going to put in the drawers… it was so funny. “You’re going to put ribbons in a tool box”…he said disgustedly. Don’t worry I do actually have tools in one of the bigger drawers. There are even a couple of empty drawers that I will be more than happy to share with my future husband…just gotta find him so I can share ;). This drawer was filled 95% of the way with things I just had to have at Hobby Lobby. I miss that store so much. They really need to get one in Southern Utah. 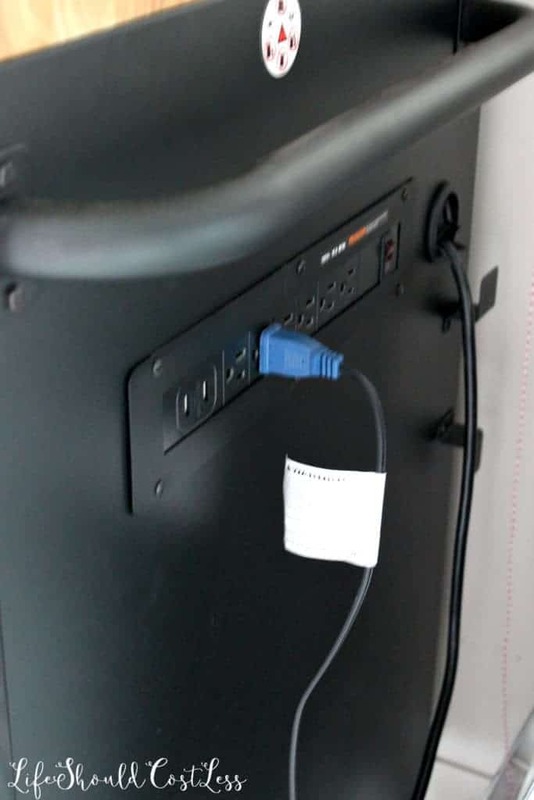 This thing even has a built in power strip with USB ports… I LOVE IT! And here is what it looks like all set up and ready to shoot a project. 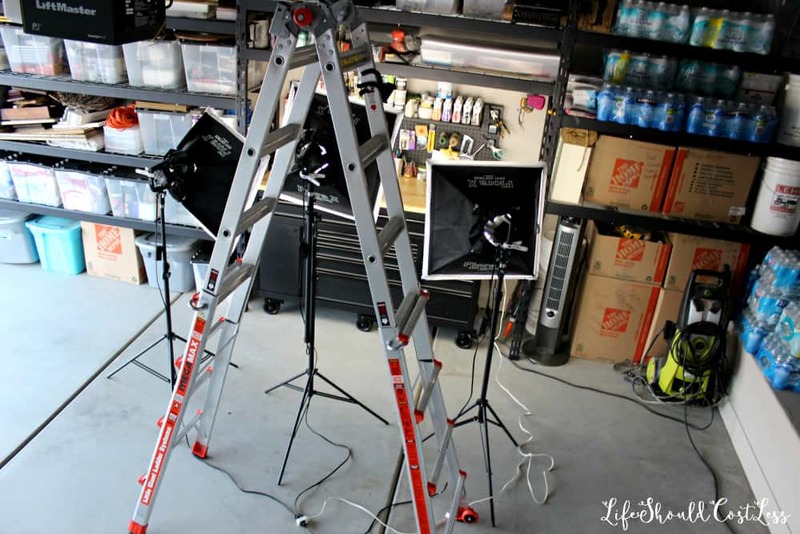 My tripod broke long ago so I am now using a ladder…it’s ghetto but it does the trick. 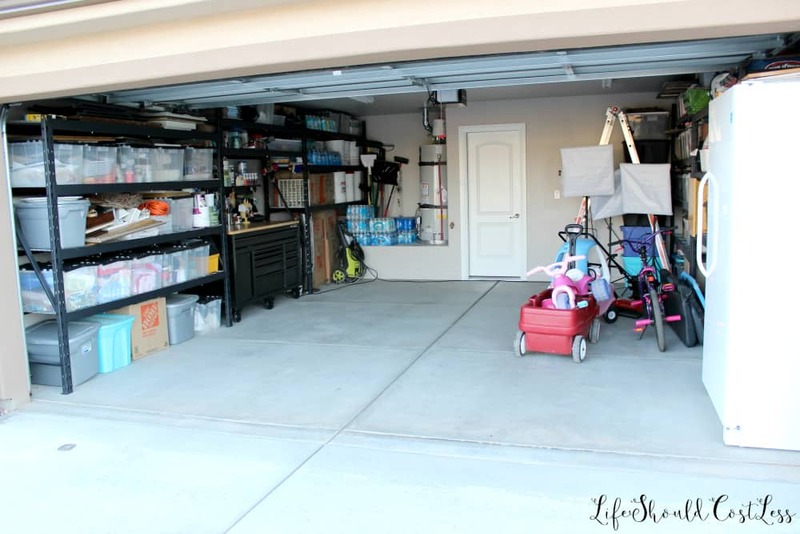 Then when I’m done I can just slide everything to the right side of the garage, along with the kids toys, and I now have an easy, organized, way to access all of our stuff and can even fit my car in there whenever I want to. 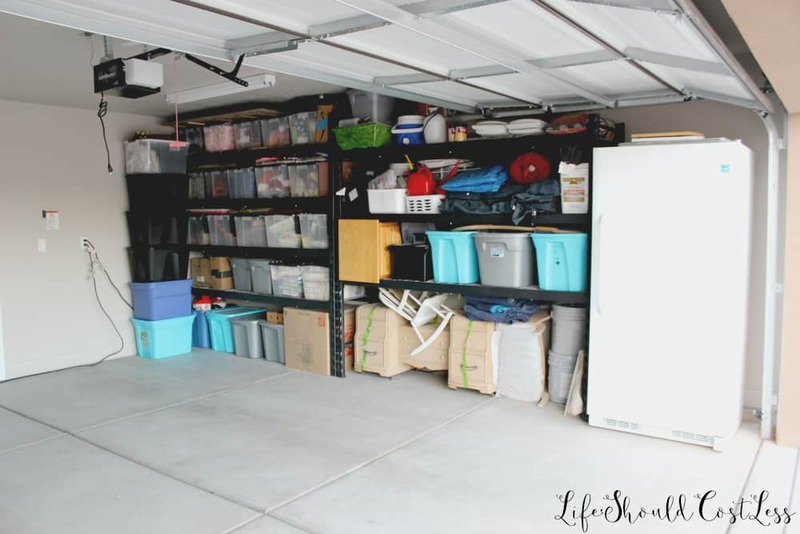 Plus, now that there was room for a freezer in the garage, I can save money on food by buying in bulk and stocking up when things go on sale!!! 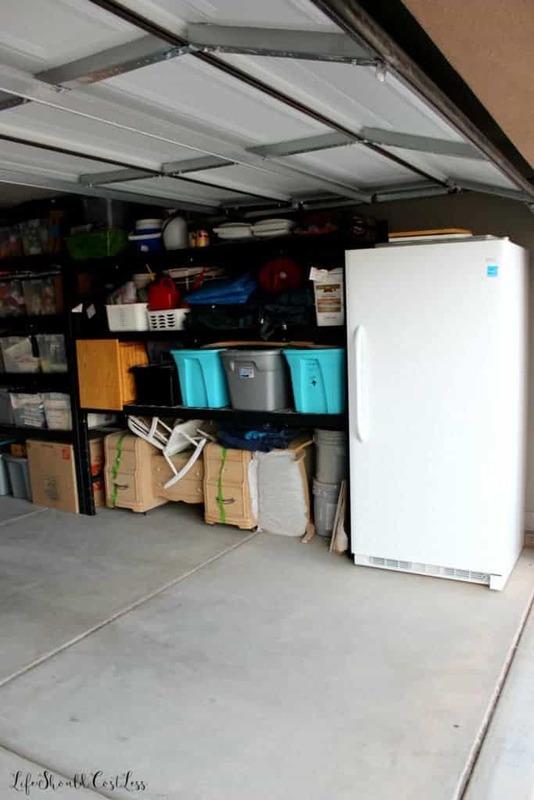 Can you believe that this was way cheaper than paying for a storage unit for three years? By more than a thousand bucks too! Not only that, but I have something to show for the money spent after those three years, the shelving and work bench should last me for decades if I take care of them. It also doesn’t hurt that I now have a dedicated place to work on projects and it only takes me a few minutes to find anything that we need. Win/win! I didn’t tell you guys that I eyeballed the measurements for the whole thing because my kids had lost my tape measure. 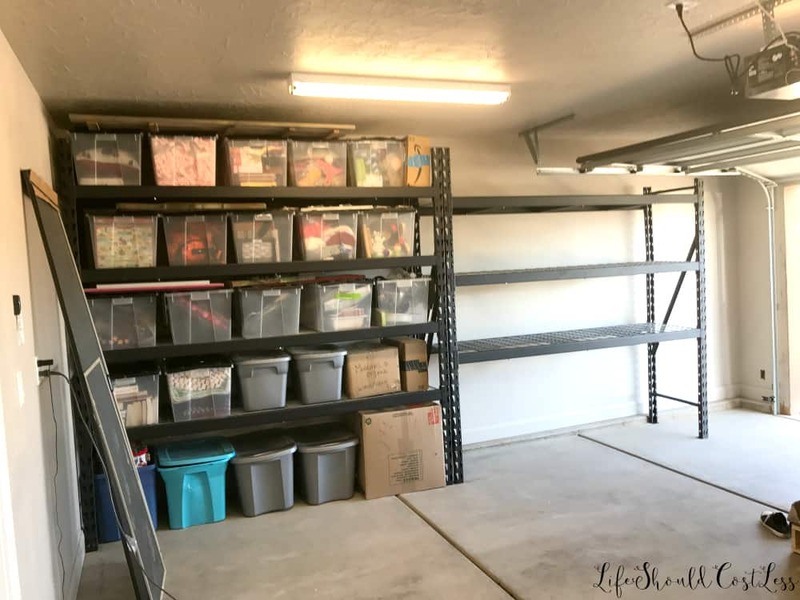 I was within about two inches on both sides…you could say that eyeballing is a hidden talent that I have, lol, I highly recommend that you measure a couple of times before you buy or order your shelving though if you are going to do this too. P.S. Check out my entire organization section if you get the urge. This one was by far my largest organization project yet, but I am going to be doing a ton in the future too and you won’t want to miss them. Can I borrow you for a couple weeks? Great job!! Looks great. 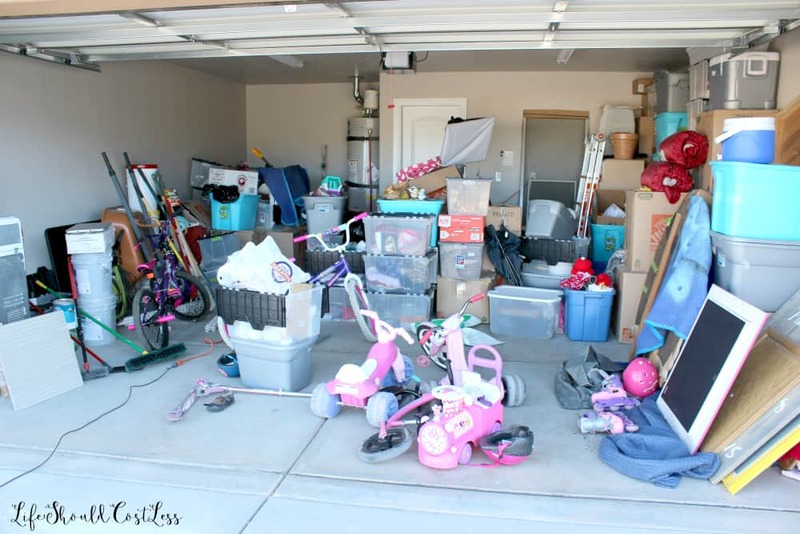 My garage is a disaster!! Thanks! My kids still drag stuff out, but it’s so much easier to put things away now. You did an amazing job. Wish I was good at eyeballing. I am what is called spacially vhallenged! Ha! Lol,thanks. It’s an odd talent to have. I’m sure you’re not that bad. Great job Sarah!! 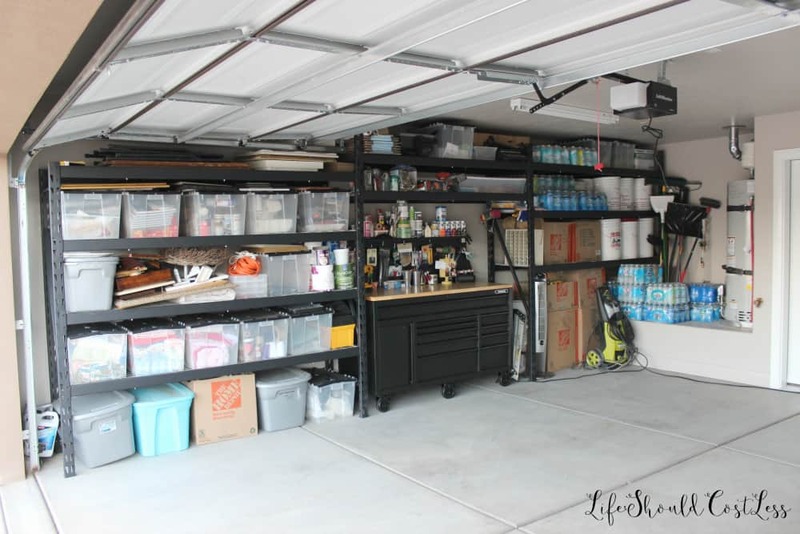 Your garage looks great and I am really inspired to start my own garage makeover. I have a similar situation and being a single mom to five children after being with my ex-husband since I was 19 has been a huge adjustment. I’m just taking it day by day I am trying to do the best I can. Thanks for sharing your stories and keep up the good work! I was with mine since I was 19 too! It’s rough but we are definitely in a similar boat. Thanks, and yes, get yours organized and you will thank yourself later, I promise.